Lessons come alive with felt sets! The realistic bugs in the Bug Book felt activity book will leave your skin crawling! Your children will go buggy over the many creepy, crawly creatures hiding underground, behind plants, or on the front porch in their various habitats. Fourteen very cute but scientifically correct Forest Animal Hand Puppets (front and back views) and 28 puppet show scripts will help you put on a great show. 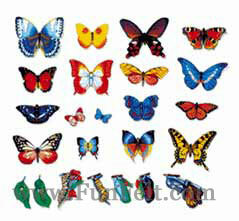 These felt Butterflies are so realistic, you will think they can fly right off the board! 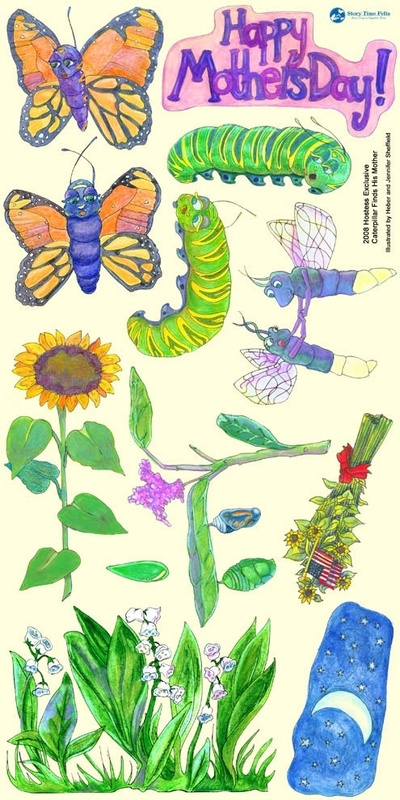 These are great for studying insects or illustrating a butterfly's life cycle. The very hungry caterpillar is so hungry, he eats his way through 14 different kinds of foods and gets very fat! Then he spins his cocoon on a leaf and turns into a beautiful butterfly. This "Who Ate The Food" set includes 21 felt figures and 2 stories to teach the life cycle of the butterfly. The rich beauty of the rain forest comes alive in felt. You'll experience the jungle, complete with felt piranha, snakes, spiders, insects, and native people, plus a lush Rainforest Felt Board habitat scene. Poems, a play, and 18 lesson ideas are also included. NEW Large and Medium size sets available! Wild Animal Figures - Thirty-one animals you will be wild about! Felt figures range in size from 1-1/4" to 5" tall. These animals are from a variety of habitats and countries. These adorable Zoo Babies Mitts are prefect for little performers! Animals include babies of the following animals: gorilla, giraffe, bear, lion, hippo, elephant, monkey, kangaroo and tiger. Your child will get to know the creatures of the deep in this beautiful mind-expanding Ocean Felt Board set! Beautiful felt board scene, 67 felt figures and informational literature are included in this imaginative yet realistic set! Your children with roar with delight as they spend hours with this colorful and engaging prehistoric Dinosaur felt board set. Large and small versions of each dinosaur are included along with figures depicting dinosaur nesting and egg hatching stages. 31 felt figures in all. Learn about the space shuttle launch sequence and characteristics of each planet in our felt Solar System. For your space traveler or explorer, this Solar System set is a must. You can use it as a decoration to enhance your child's space-themed room and teach about the universe at the same time. Fifty-seven life-sized felt food items help children choose healthy eating habits with our felt Food Guide Pyramid Set. They can set a table with a felt plate, fork, knife, and spoon, and select a balanced meal from the felt pyramid. The food looks good enough to eat! Large and Medium size set available!